A105 percent rise in the estimated population over a six-year period casts Buda as the Hays County city with the highest growth percentage since 2010, according to new Census Bureau estimates released in late May. According to the statistics, which included population estimates as of July 2016, Buda has ballooned to just over 15,000 people. Six years ago, during the 2010 Census, Buda had just over 7,200 people. From 2015 to 2016, Buda’s population rose by 40 percent, which was the highest among the five major cities in the county. 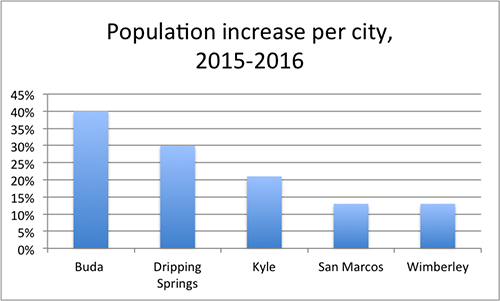 Dripping Springs, which has an estimated 2016 population of 3,140, had the second highest population growth rate among the five major cities between 2015 and 2016, while Kyle was third. Todd Purcell, Dripping Springs mayor, said in an emailed response his city’s estimates come as no surprise. However, with the growth, Purcell said the city has a “significant responsibility” to tackle “head-on” many critical infrastructure issues, such as road and wastewater capacity. “It’s necessary to protect our envied quality of life,” Purcell said. 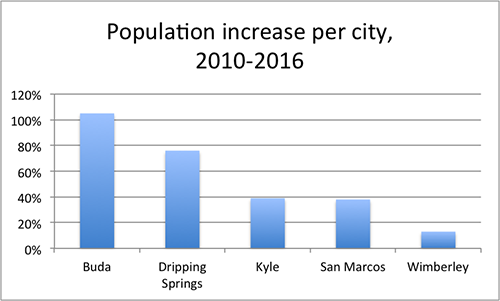 San Marcos, which was deemed the fastest growing city in the U.S., according to 2014 Census estimates, only saw 13 percent growth between 2015 and 2016. Ruge cites Buda’s proximity to Austin and its good schools lend to more people setting up in Buda. Despite the growth, Ruge said the city continues to maintain its “small town charm” that he feels is attractive to people. However, Ruge said he doesn’t see an end to the constant growth that’s coming to Buda. He cited how Buda’s city limits to the north touch Austin’s city limits. He also said developments that are not in the city limits, such as the Sunfield Municipal Utlity District, are starting to grow. “One thing it does for us, there’s more people paying in. We still have one of the lowest property tax rates in our area,” Ruge said. With the growth comes a strain on infrastructure, as well as housing. Approval of the 2014 bonds is one way Ruge felt the city could accommodate the growth. But Buda still faces challenges in securing adequate water resources in the future. Legislation making it easier for aquifer storage and recovery (ASR), which was backed by the city, died prior to the end of the 85th Texas Legislative session. Public safety is also a factor Buda will have to keep up with in the future, primarily the ratio of police officers to residents. Housing is also an issue the city must deal with. Currently, Buda’s “bread and butter” are $300,000 to $400,000 homes. However, a major announcement in the next few months could go “hand-in-hand” with providing more affordable alternatives for residents. “It has more to do with geography and positioning along Interstate 35,” Webster said. Much like Buda, challenges in providing infrastructure and dealing with growing pains continue to come up. Plans include expanding the city’s wastewater plant, which is a priority in the city’s 2018 budget discussions. The city has also had conversations for a second regional wastewater treatment plant to accommodate development on the southside. Discussions have also included how to possibly finance such a project. “We’re planning for the next one, which is the kind of thing that needs to be going on, and not for just the next five, six or ten years,” Webster said. Webster said the most important thing the city needs is “diversified housing market.” He said the city is focusing on executive level housing.